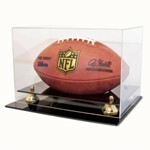 This Ball Qube acrylic football display case is the best value priced choice for all your sports collectibles. The built in ball rings allow you to display a football in either the vertical (shown), or horizontal position without the ball falling over. Interior dimensions are 11 1/2 x 7 x 7. Price includes 1 free nameplate. Additional nameplates are available. MIRRORED BACK PANEL OPTION HAS BEEN DISCONTINUED. 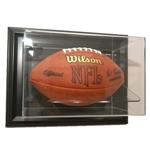 Ball Qube acrylic football display case with built in ball stand is the best value priced choice for all your sports collectibles and client gifts. It's durable construction is the best protection of your collection. Interior dimensions are 11 1/2 x 7 x 7 Price includes 1 free nameplate. Additional nameplates are available. black base is removable for more versatile display options. 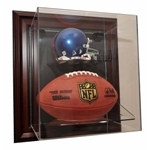 Football acrylic case with all clear construction so you can see the ball from all angles. investment in the protection of your memorabilia collection. Includes 1 free nameplate. 13x8x8. Wall mountable full size football acrylic case with black base and gold risers. This is similar to our desktop case, but with a wall mound bracket on the back. Features a full mirrored back. Also features optically clear, richly beveled UV protected acrylic, all handcrafted and polished to a high luster This is not one of those cheap, mass produced display cases. This is a high quality investment in the protection of your memorabilia collection. Price includes 1 free nameplate. DONT NEED A COMPLETE DISPLAY CASE! 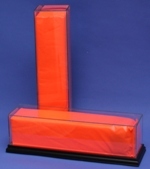 Football acrylic display stand - holder featuring custom ball supports. if you want to display your football, but dont want-need a complete display case. Includes 1 free nampelate. Additional nameplates are available. Premium quality UV protected acrylic football display case with a two tier black base that holds any single miniature football. Features a mirrored back. Dimensions: 9.75" x 6" x 5.25". This is not one of those cheap, mass produced display cases. This is a high quality investment in the protection of your memorabilia collection. Price includes 1 free nameplate. Additional nameplates are available. If no nameplates are wanted, simply leave that field blank.